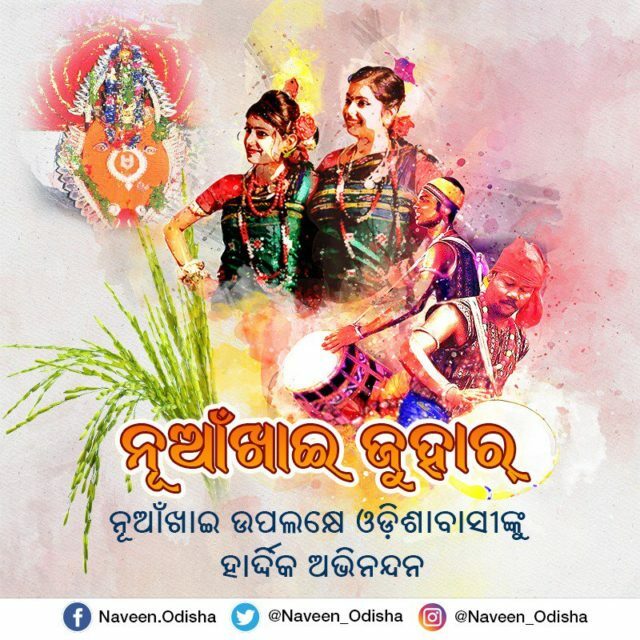 Bhubaneswar: Chief Minister Naveen Patnaik, Vice President, Dharmendra Pradhan and other leaders extended their warm wishes to people On the auspicious occasion of Nuakhai . Patnaik also tweeted a picture depicting the folk dance of Western Odisha with Maa Samaleshwari- the region’s prinicipal deity of worship, the background. Besides, Vice President M Venkaiah Naidu also extended his greeting to the people of Odisha and Chhattisgarh. Naidu took to the twitter and wrote: “Nua Khai Juhar! My greetings to the people in Odisha and Jharkhand on the auspicious occasion of Nua Khai, the harvest festival. #NuakhaiJuhar #Odisha”. He said: “The festival reminds us of the important role of agriculture in our lives from times immemorial. Let us salute farmers of the country on this auspicious day and take a pledge to improve their lot. May this festival bring cheer, joy, prosperity and happiness to all! #NuakhaiJuhar”.